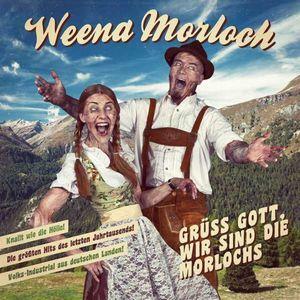 Content: Weena Morloch is back on track unleashing their weirdest album to date. Samsas Traum front man Alexander Kaschte seems to have exorcised one of his craziest musical ideas consisting of an album filled with cover versions. The concept is not that new at all, but this artist did with some fun. The result is mixing the mainly metal elements of the band together with a pure ‘schlager’ approach. ‘Schlager”-music is quite common and popular in Germany and is something you’ll more associate as ‘kitsch music for older people’. The front cover with this typical Tirol-like outfit perfectly fits to the work while another picture inside also reveals a naughty and more aggressive perception. Weena Morloch has merged two opposites creating an artistic sonic sculpture out of water and fire. The choice of the original songs is very important and I was rather surprised to discover covers from artists like Ramones and Death In June. But other names like Survivor, Dschinghis Khan, Milli Vanilli and Ivan Rebroff are more surprising and sometimes totally kitsch-like. Just give some time to go and search on Youtube for clips of Dschinghis Khan and Ivan Rebroff and you will immediately understand what I mean. You afterwards will fully understand the totally hilarious concept of this production. I definitely experience it more as a joke instead of a credible album, but it’s a good joke and so it finally becomes a good album as well. My personal favorite song is Ramones’ cover of “The KKK Took My Baby Away”, which was transposed into a kind of disco-rock. Another great moment is the opening cut “Tränen Lügen Nicht” originally performed by Michael Holm (the original clip is absolutely surreal), which was adapted into a kind of Rammstein format driven by furious guitars and impressive electronic sequences. The “Moskau”-song from Dschinghis Khan makes me think of a song of drunken students revealing this kind of kitschy Russian-minded chorus. Survivor got some international success through their legendary “Eye Of The Tiger”, which you for sure will remember from the “Rocky”-movie. The cover is not as hilarious, but simply a solid rock-metal song. In a similar style and from a similar artist you also will discover “Holy Diver” originally performed by Dio. It all ends with a new ‘schlager-metal’ song from the German army entitled “Schwarzbraun Ist Die Haselnuss”. Conclusion: You don’t necessarily need to wear ‘Lederhosen’ to enjoy this album, which definitely appears to be one of the funniest and entertaining release in history of metal-related music! Best songs: “The KKK Took My Baby Away”, “Tränen Lügen Nicht”, “Des Teufels Don Kosaken”. 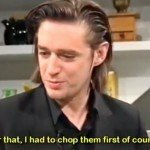 Blixa Bargeld from Einstürzende Neubauten cooking Risotto on German TV? Yes, it's caught on tape!